Please allow me to introduce myself: I’m Aurelio Madrid from the United States and I have discovered your gallery online while searching for the artists Cyprien Gaillard & Piero Golia. 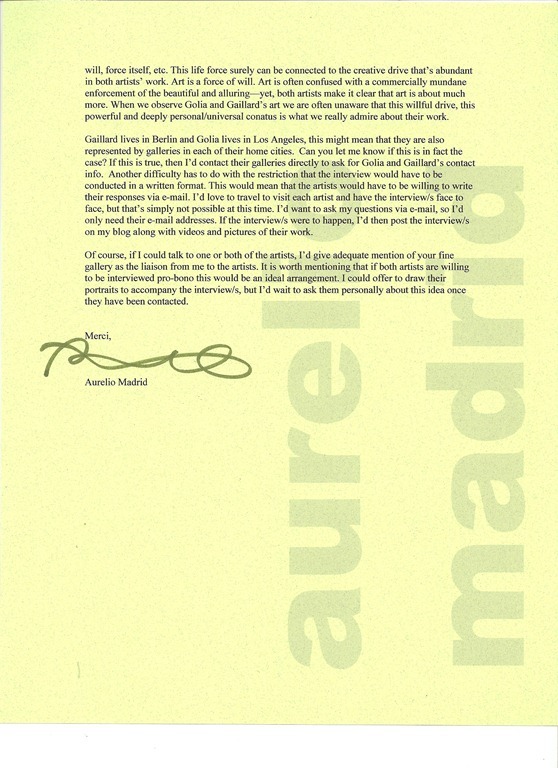 I write a blog http://www.aureliomadrid.wordpress.com that features my philosophical research as much as it’s devoted to art criticism and art theory. I’m also an artist and a philosophy student. 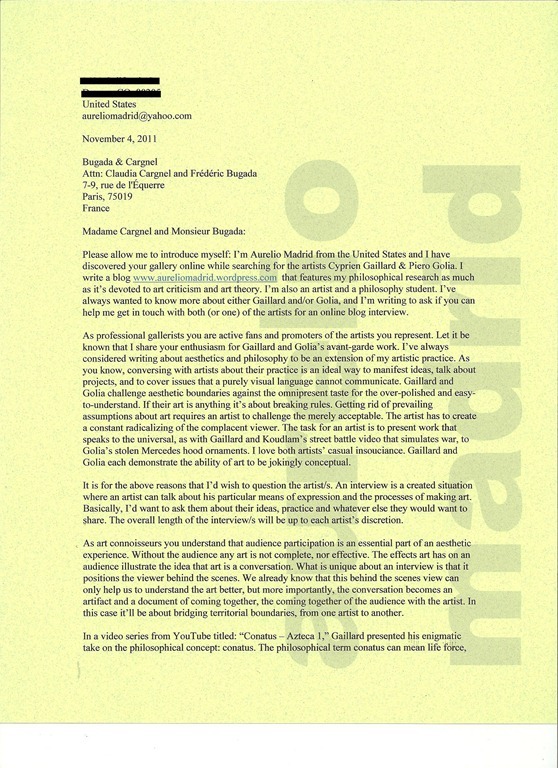 I’ve always wanted to know more about either Gaillard and/or Golia, and I’m writing to ask if you can help me get in touch with both (or one) of the artists for an online blog interview. As professional gallerists you are active fans and promoters of the artists you represent. Let it be known that I share your enthusiasm for Gaillard and Golia’s avant-garde work. I’ve always considered writing about aesthetics and philosophy to be an extension of my artistic practice. As you know, conversing with artists about their practice is an ideal way to manifest ideas, talk about projects, and to cover issues that a purely visual language cannot communicate. Gaillard and Golia challenge aesthetic boundaries against the omnipresent taste for the over-polished and easy-to-understand. If their art is anything it’s about breaking rules. Getting rid of prevailing assumptions about art requires an artist to challenge the merely acceptable. The artist has to create a constant radicalizing of the complacent viewer. The task for an artist is to present work that speaks to the universal, as with Gaillard and Koudlam’s street battle video that simulates war, to Golia’s stolen Mercedes hood ornaments. I love both artists’ casual insouciance. Gaillard and Golia each demonstrate the ability of art to be jokingly conceptual. It is for the above reasons that I’d wish to question the artist/s. An interview is a created situation where an artist can talk about his particular means of expression and the processes of making art. Basically, I’d want to ask them about their ideas, practice and whatever else they would want to share. The overall length of the interview/s will be up to each artist’s discretion. As art connoisseurs you understand that audience participation is an essential part of an aesthetic experience. Without the audience any art is not complete, nor effective. The effects art has on an audience illustrates the idea that art is a conversation. What is unique about an interview is that it positions the viewer behind the scenes. We already know that this behind the scenes view can only help us to understand the art better, but more importantly, the conversation becomes an artifact and a document of coming together, the coming together of the audience with the artist. In this case it’ll be about bridging territorial boundaries, from one artist to another. In a video series from YouTube titled: “Conatus – Azteca 1,” Gaillard presented his enigmatic take on the philosophical concept: conatus. The philosophical term conatus can mean life force, will, force itself, etc. This life force surely can be connected to the creative drive that’s abundant in both artists’ work. Art is a force of will. Art is often confused with a commercially mundane enforcement of the beautiful and alluring—yet, both artists make it clear that art is about much more. When we observe Golia and Gaillard’s art we are often unaware that this willful drive, this powerful and deeply personal/universal conatus is what we really admire about their work. Gaillard lives in Berlin and Golia lives in Los Angeles, this might mean that they are also represented by galleries in each of their home cities. Can you let me know if this is in fact the case? If this is true, then I’d contact their galleries directly to ask for Golia and Gaillard’s contact info. Another difficulty has to do with the restriction that the interview would have to be conducted in a written format. This would mean that the artists would have to be willing to write their responses via e-mail. I’d love to travel to visit each artist and have the interview/s face to face, but that’s simply not possible at this time. I’d want to ask my questions via e-mail, so I’d only need their e-mail addresses. If the interview/s were to happen, I’d then post the interview/s on my blog along with videos and pictures of their work. Of course, if I could talk to one or both of the artists, I’d give adequate mention of your fine gallery as the liaison from me to the artists. It is worth mentioning that if both artists are willing to be interviewed pro-bono this would be an ideal arrangement. I could offer to draw their portraits to accompany the interview/s, but I’d wait to ask them personally about this idea once they have been contacted.